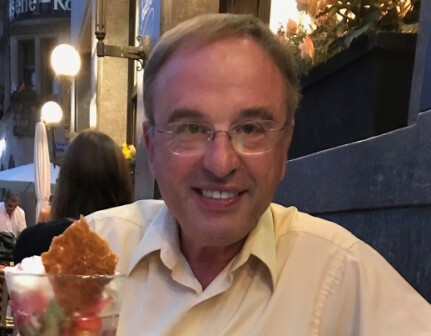 Jose E. Valentini, age 68, of Hockessin, DE, a U.S. citizen born in Argentina, died on April 11, 2019 at Barclay Friends, West Chester. PA.
Jose was born in Cordoba, Argentina, son of Irma Drehock Valentini and the late Cesar Valentini. He attended the University of Buenos Aires, Argentina, receiving his Master of Science in Chemistry, in 1974. He went on to the University of La Plata, Buenos Aires, Argentina, where he received his Doctorate degree in Chemical Engineering, in 1977. He also earned his Masters of Science in Public Health at the University of Pittsburgh, Pittsburgh PA, in 1980. Jose also attended various flying schools in the Northeast, United States earning his private pilot license, instructor and ATP for single and multiple engine planes from 1984 to 2014. He was fluent in speaking Spanish, Italian, English and most recently, German. Jose worked for the duPont Company in Research & Development in different groups for 37 years, in Buenos Aires, Argentina; Brevard, NC and Wilmington, DE. While in Brevard, N.C., he was also part of Sterling & AGFA, as the site changed hands. He also worked for Huntsman Textiles Inc. with R&D assignment in Basel, Switzerland/Germany, for 4 years. Jose became a professor at the Delaware State University, Aviation School for 2 years. Throughout his career he was also an aviation instructor at Mountain Air Cruise,LLC. He was a member of the American Chemical Society for over 40 years, including receiving a prestigious award in recognition of his contributions to science. He was also a member of Sigma XI, AOPA and several aviation clubs in Eastern PA..
Jose is survived by his wife of 40 years, Silvia C. Valentini, his son, Bryan E. Valentini(Niki Sawyer) of New York, daughter Romina N. Valentini, of Philadelphia, PA., his 96 yr. old mother, Irma D. Valentini, his brother Cesar N. Valentini, his nephew, Lionel C. Valentini, all of Buenos Aires, Argentina and his beloved children cats, Spooky and Buttons. The day of Jose’s passing, the family held a private prayer service. The family celebrated Dr. Valentini’s life with him, recently inviting family, friends and acquaintances that visited him while in medical treatment at Barclay Friends to share memories, stories, photos, messages read to him, etc. from friends from as far as Japan, Argentina, Germany, and Singapore. Jose’s life passion was flying, the reason why he spent his last years flying and teaching young students to become pilots. Memorial Contribution to help a young life reach their dream of flying someday may be made to his school, Delaware State University, Aviation School, 1200 N. Dupont Hwy, Dover, DE 19901. Dear Jose, I am very sad that you had to leave us that early. Always shall I remember your cheerfulness and your enthusiasm for flying and for the discoveries we made on our common trips by plane in Europe. You were the best mate I can imagine. May you Rest In Peace. My heartfelt condolences go to the family, may you be comforted. I was greatly saddened of hearing of Jose's passing. He was one of my greatest friends and co-worker at DuPont. We both shared a great enthusiasm for science, flying and orchids. We had several patents that we developed together that I am very proud of. I will greatly miss you my friend. Pat McIntyre. Dear Silvia, We feel very sorry for your lost, it was a pleasure to visit you and Jose last year while my parents were visiting NY and we had the opportunity to drive to PA. We will always remember Jose telling us his memories of traveling and flying too many countries. Te queremos mucho y te mandamos un gran abrazo de toda mi familia. Querida prima.Te acompañamos con mucha triteza en este momento tan dificil. Josè fue una persona muy amable ,gentil y hospitalaria con nosotros.QEPD. Ralph Waldo Emmerson said, “The purpose of life is not to be happy. It is to be useful, to be honorable, to be compassionate, to have it make some difference that you have lived and lived well.” Some people spend an entire lifetime wondering if they made a difference in the world, but Jose Valentini didn’t have that problem. Jose was a man of great intellect, drive, and ingenuity. Here the record stands through his education and life’s work as a scientist and instructor. What is more, he was a person of great love, compassion, and integrity. I will always remember Jose as a man whose life spoke volumes. This was especially made clear in his love for his family, friends, and God; and their love for him. As such, Jose Esteban Valentini not only lived life well, but was equally happy in doing so. Silvia, Bryan, and Romina, I am so sorry for your loss, but I am confident that while Jose’s mind and body were encumbered by illness in his final days, those restraints are now lifted. He is himself again - more himself than at any time on this earth. For we may be sure that the Lord never forgets those who remember Him, and as the last journey of this faithful pilgrim took him beyond the sunset, and as heaven's morning broke, I like to think - in the words of John Bunyan, that “all the trumpets sounded on the other side.” We here still move in twilight, but we have one beacon to guide us that Jose Valentini never had. We have his example. Let us give thanks today for a life that achieved so much for us all. God bless. . . Jack Hickey, Sr. I had the pleasure of working many years with Jose at DuPont. He was always a kind and generous soul; always had a smile and a piece of chocolate for you. He left us way too early. Deepest condolences to the Valentini family. Be comforted knowing that he is now flying with the angels. I worked with Jose at DuPont and knew him outside of work from our shared love of flying. I'm so sorry to hear Jose passed. He always had a smile and I enjoyed our conversations both technical and about flying. I'll miss him. It is hard to believe that Jose left us. We had a great time at DuPont and I will always remember his smile and cheerfulness. My deepest condolences to the family.